The name provided to DssW when buying your licence. This name must be entered as written in your licence details. The organisation provided to DssW when buying your licence. This organisation name must be entered as written in your licence details. If you did not provide an organisation name or have bought a personal licence, your licence's organisation name will probably be 'Personal'. The code provided by DssW in your licence. The code must be entered as written in your licence details. The code starts with 'PM' and includes a few hyphens. You may find it easier to copy and paste the code into this text field. 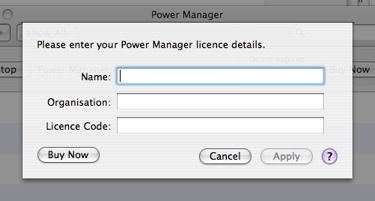 Cancel closes the licence window without changing Power Manager. Apply is only available after the three required text fields above are completed. The required text fields are name, organisation, and code. Your licence details will be checked and applied if valid. If a problem is discovered, you will be informed and asked to check your details. If you continue to have problems with your licence details, try copying and pasting in the details from the licence details e-mail. Make sure the case is correct, and that no spaces or quotation marks remain at either end.